Prescribing rates for the attention-deficit hyperactivity disorder (ADHD) drug Ritalin vary widely across England, figures show. Official statistics show a 23-fold difference between the lowest and highest prescribing areas. The Liberal Democrats called for an "urgent analysis" but the government said prescribing was down to doctors. The Wirral had the highest rate, with pharmacists dispensing 144 prescriptions for every 1,000 children. But local health chiefs said high rates might reflect a positive hands-on approach by GPs. 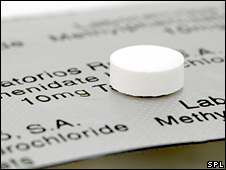 Ritalin is prescribed in the UK for children diagnosed with ADHD. Many doctors say it can help children control their behaviour and perform better at home and school. However, there have been concerns that the drug, a type of amphetamine, is being over-prescribed. The National Institute for Health and Clinical Excellence, which offers guidance on treatments in England, has endorsed the use of Ritalin in some cases of ADHD. In the Wirral, the prescribing rate of 144 prescriptions per 1,000 children under the age of 15, compares with an English primary care trust average of 43, figures highlighted by the Health Service Journal show. Other areas with rates at least double the average included the Isle of Wight, Great Yarmouth and Waveney, County Durham and Medway in Kent, while Stoke-on-Trent had the lowest rate. Gary Sendall, who runs a support group for older ADHD patients in the Wirral, said the local NHS provided a good, responsive service for children with suspected ADHD. He said: "To be honest, it's quite disappointing that Ritalin is criticised - although it's not the answer for everyone, it can help a lot of people." A spokesman for the ADHD charity ADDISS said: "In some areas it is much harder for a child to receive proper assessment, be diagnosed with ADHD and treated appropriately. There are undoubtedly wide variations." She said the Wirral was generally regarded as a "forward looking" area in terms of ADHD care. Wirral PCT, while acknowledging that the figure was higher than in other PCT areas, said this could be misleading. A spokesman said there were roughly 800 people receiving Ritalin in a population of 335,000. He said "excellent" specialist services meant more children were likely to be diagnosed with ADHD and its more highly trained GPs were more likely to be prepared to take over responsibility for repeat prescriptions from hospital teams. Both of these factors would swell Ritalin prescribing figures for the area, he suggested, as hospital Ritalin prescriptions would not appear in these statistics. A Department of Health spokesman said any decision to prescribe Ritalin was a "clinical" one. He said the statistics related only to items dispensed, rather than the actual number of children taking the drug. But Liberal Democrat health spokesman Norman Lamb said: "These are dramatic variations which do not appear to be driven by need. "It looks as though some parts of the country are massively oversubscribing Ritalin, while others are way below average. "An urgent analysis of this extraordinary variation is required."